(Nanowerk Spotlight) Three-dimensional (3D) printing, also known as additive manufacturing, is a fabrication method that creates structures from digital models. Unlike conventional fabrication methods, 3D printing processes are bottom-up fabrication methods which are based on the incremental addition of layers of materials. Compared with traditional manufacturing technologies 3D-printing is a more convenient and efficient way to prepare complex 3D structures. In addition, 3D-printing requires fewer steps and resources. 3D-printing is currently being explored for many different applications, including electrochemical devices, biomaterials (for instance as a 3D printable ink that produces a synthetic bone implant), and microfluidic devices where the microfluidic channels are 3D-printed. In addition, 3D-printing with graphene has been demonstrated, and metal-organic frameworks, and many other materials have been prepared by the printing process. 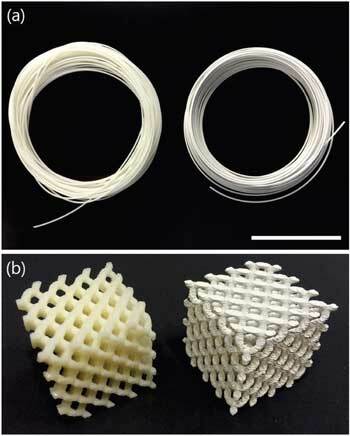 Recently, 3D-printing has also been shown to be advantageous to catalytic applications since a printing approach can achieve better control of the fine structure of the target material. It is expected that 3D printing fabrication will provide new solutions for preparing catalysts with new structures in a more economical and energy-efficient way. As 3D-printing techniques have developed, setup and operational costs have decreased rapidly. The control and precision of the properties of the printed materials have improved. Therefore, it is reasonable to expect that using additive manufacturing to prepare catalytic materials will continue to develop in the coming years. A new review article by two scientists in China (Advanced Functional Materials, "Three-dimensional Printing for Catalytic Applications: Current Status and Perspectives") provides a general overview of commonly available 3D-printing methods that are feasible for the preparation of catalytic materials is given. In addition, the authors summarize recent works concerning printing strategies and new materials for catalytic use. Potential catalyst applications are also included. Finally, they address future expected developments in this very promising field. The authors first provide an overview of 3D-printing technology – Fused Deposition Modeling; Stereolithography; Direct Ink Writing; and others such as selective laser sintering, selective laser melting, and inkjet head 3D-printing. Next follows an overview and detailed discussion of 3D-printed catalytic materials – polymers; carbon materials; metals and metal oxides; and zeolites. They discuss the diverse structures that can be designed and accurately controlled. 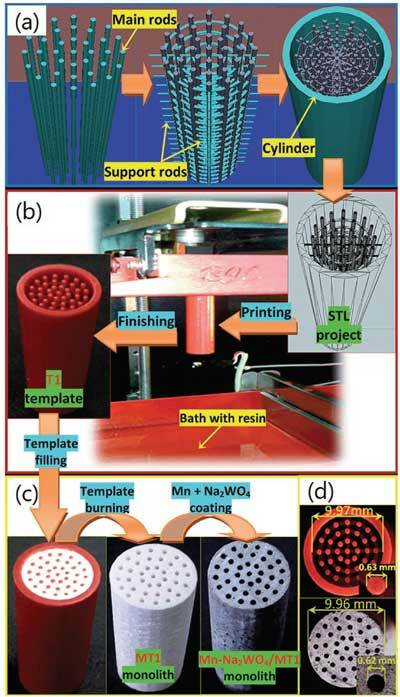 In many ways, 3D-printing has a great potential for future development of various catalysts. 1) Better control of the micro/meso structures of printed catalytic materials is needed. One way to achieve this goal is to improve the accuracy of 3D printers. The concept of nanoscale 3D printing is being developed using techniques like electrohydrodynamic printing and focused ion beam. Great gains are being made, but the output of these processes cannot yet meet the needs of industrial applications. A way to improve accuracy is to produce 3D printable nanoscale ink. Synthetic methods of the ink are important for better control of nanoscale structures and improvements in production capacity are crucial for industrial use. 2) The feedstock materials for 3D-printing need to be further improved. Recently, a wide range of materials have been used in 3D printing, but there are still problems to be solved. Firstly, the material directly determines the cost of the printing process, which is crucial for its applications. Some materials need to be printed by special equipment, which leads to a high fixed cost. Secondly, some materials require complex post-treatment processes. The preservation of the structures of the 3D printed materials is a challenge. Both the printed macroporous structure and the inherent micro/meso structure of the materials may be affected by the post-treatment processes. Solvent removal is needed for some extrusion based printing processes, which can cause shrinkage and pore structure damage. Calcination can cause negative effects on the pore structure, especially for powder based printing. Improvements are needed to overcome the effects of the post-treatment processes. In addition, the mechanical properties and chemical stabilities of the 3D-printed materials have to be considered when being used as catalysts. The differences in the mechanical properties and chemical stability between various 3D printed materials and materials prepared through conventional methods have not been fully studied. 3) Optimized catalyst design is further needed. With 3D-printing techniques, it is feasible to control pore size, pore structures, and even the distribution of the active ingredients in catalytic materials. As a result, the structural optimization of catalysts is becoming more important in order to maximize catalytic performance.